This month (June 2017), a joint collaborative team from NASA Ames and Spain’s Centro de Astrobiologia (CAB) have brought and successfully tested astrobiology and sampling technologies at the Rio Tinto analog site in southern Spain, bringing these closer to future life-search mission readiness. One of the current leading future concepts for searching for signs of past or current life on Mars is the “Icebreaker” mission concept, which would send a Phoenix or InSight-like lander to Mars with a drill, robot arm and instruments capable of detecting signs of life, similar in some respects and appearance to the system tested at Rio Tinto. Under the NASA Science Mission Directorate’s Moon and Mars Analog Missions Activities (MMAMA) program, the Life-Detection Mars Analog Project (LMAP) brought together in Spain a prototype 2m planetary drill by Honeybee Robotics, a 2m robot arm from MDA Aerospace (with an Ames scoop), and the Signs of Life Detector (SOLID) immunoassay instrument from Spain’s CAB, all managed and run by Ames drilling automation and robotic control software. This robotic system was mounted on an aluminum full-size InSight lander mockup and operated autonomously at Rio Tinto during the week of June 5-9. Rio Tinto, as an analog site, provides extremophiles living off the energy stored in a broad variety of target rocks underground, as we might find in places outside the Earth. 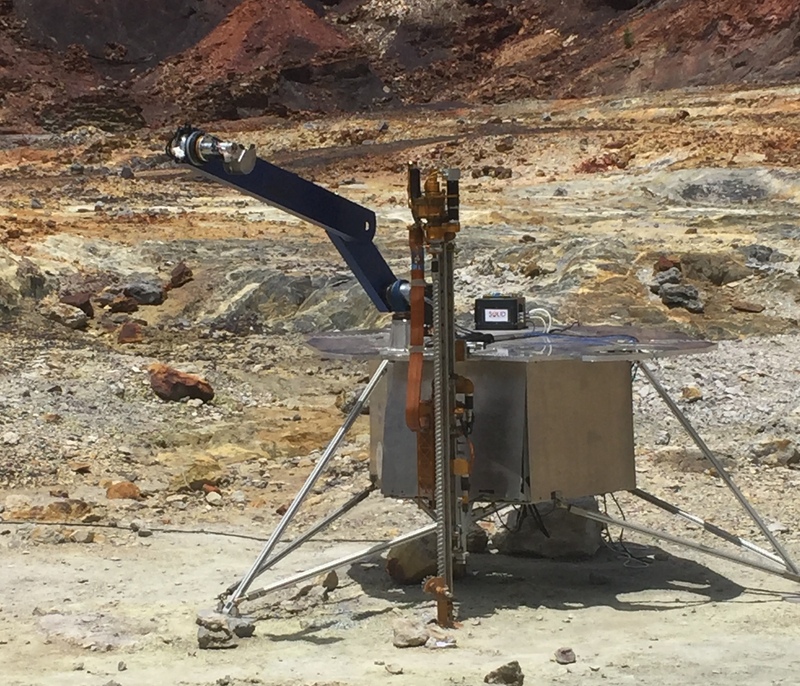 LMAP lander field testbed, showing its 2m drill, robot arm and the SOLID instrument, is tested at the Rio Tinto Mars-analog site on June 8. Drilling a net 8m in 11 holes, the LMAP lander prototype autonomously acquired and provided pulverized sample material to the SOLID instrument, which subsequently detected several species of bacteria native to the Rio Tinto area’s unusually acidic (1.5-2.5 pH) soils. The robotic technologies demonstrated included fault detection and recoveries while drilling, precise placement and robotic delivery of small sample quantities (1-2 grams dispersed out of typically 50-100g), and operational real-time onboard planning and scheduling. “I was surprised at the smoothness and precision, it was really solid,” said Dr. Carol Stoker, the LMAP and Icebreaker chief scientist. 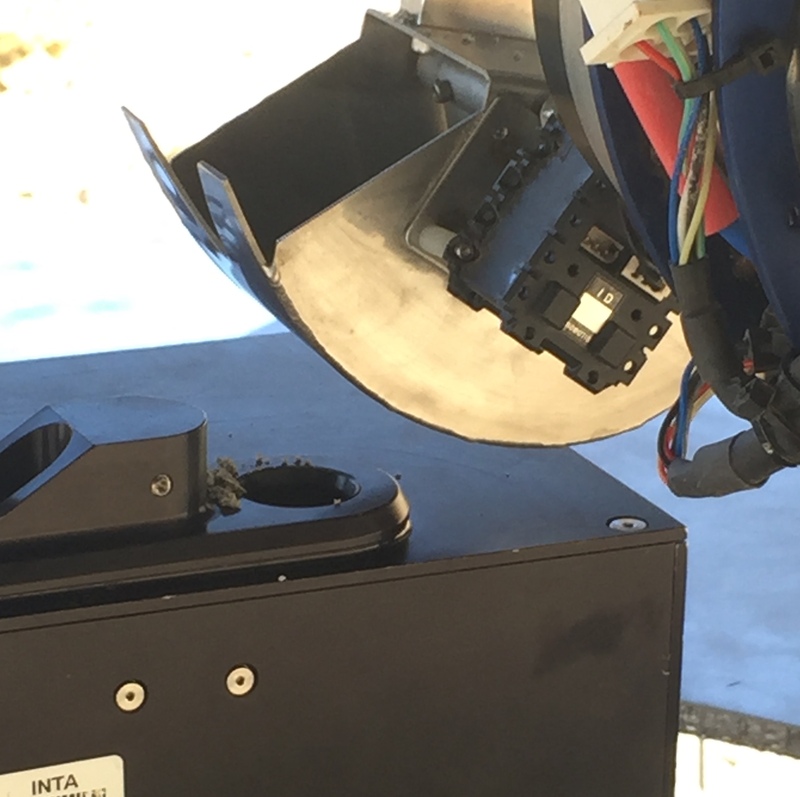 Scoop on LMAP robot arm delivers 2g of drilled sample into the Signs of Life Detector (SOLID) instrument on the deck. The search for evidence of ancient climates, extinct life, and potential habitats for extant life on Mars, given the desiccated and irradiated conditions near the surface, will require drilling or some other form of subsurface access. By testing robotic drill and sampling systems together with prototype life-detection instruments to test the “ground truth” of organics and biomarkers found underground at an easily-accessible Mars analog site, the LMAP tests in Rio Tinto are an important first step.